Using our extension you can easily migrate categories data from Magento 1 to Magento 2. Export category data including Product Sku. Using our extension you can export the categories from Magento 1.4.x – 1.9.x (using our Magento 1.4.x – 1.9.x extension package) and import them in Magento 2.0.x, 2.1.x, 2.2.x (using our Magento 2.0.x, 2.1.x, 2.2.x extension package) easily.You can easily migrate your categories data from Magento 1 to Magento 2. This extension facilitates creation of multiple categories, at-a-time using CSV files. You can easily add/update and delete categories using only single CSV file. Using our Magento 2.0.x, 2.1.x, 2.2.x extension package you can import and export the categories easily in Magento 2.0.x, 2.1.x, 2.2.x only. 1. First go to MageBees > Export Categories For Magento 2 Menu in admin panel. 1. Please select store from which, you want to export categories. 3. Finally, Click on "Export Categories" button. You will get waiting screen. 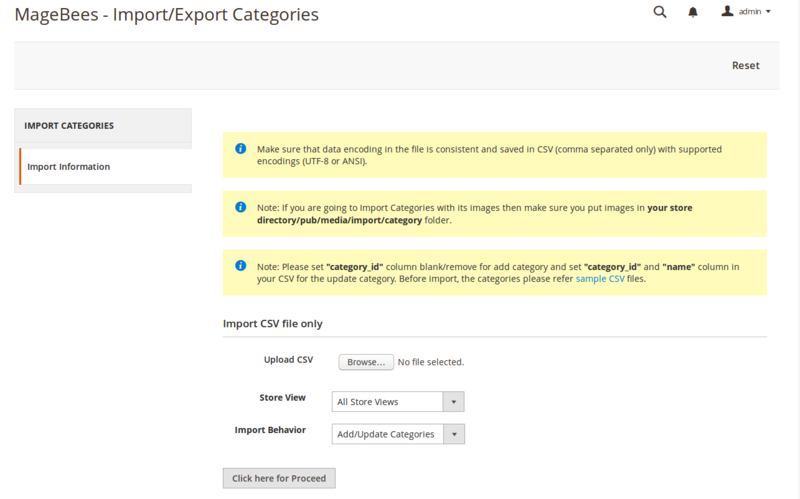 2) Go to Your Site Backend -> SYSTEM -> MAGEBEES – Import Export Categories -> Import Categories. 3) Please upload your created csv file and click on “Click on for Proceed” button. 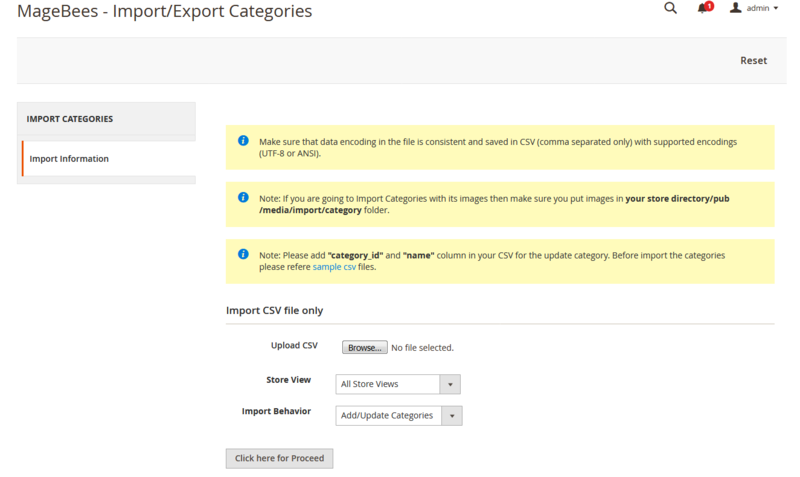 1) Go to Your Site Backend -> SYSTEM -> MAGEBEES – Import Export Categories -> Export Categories. Perfect extension for migrating all categories in one go. We recently used it to migrate categories data from Magento 1 to Magento 2. It works like a charm. No complaints at all. Use it when you are migrating from Magento 1 to Magento 2. Migrating data categories is a big task especially when you have a large number of categories. But, this extension makes it a seamless straightforward process. I would recommend this extension to anyone looking for a accurate data migration. This is the second Magebees expansion we purchased, and again it was a charming experience.Support is responsive and continued aiding until the point that the extension worked fine. This is by far the best categories import/export extension on the marketplace. Simple, quick and saves you a TON of time & money. Categories Data Migration from Magento 1 to Magento 2. Q-3: How can I import Images from Magento 1 to Magento 2? Ans : First export categories from Magento 1 and then copy your “media/catalog/category” folder from Magento 1 and Put in your "pub/media/import/category" folder in Magento 2.